17 December 2010, at 12:40p.m. ARGENTINA - Granja Tres Arroyos has selected the Petersime BioStreamer for its new hatchery. Granja Tres Arroyos employs over 4,500 people and is one of the biggest poultry producing companies in Argentina today. Its entire poultry integration, from breeder farms to further processing, meets the highest standards in technology, biosecurity and quality. 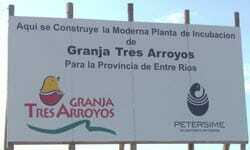 Over the past years, Granja Tres Arroyos managed to continue to grow in the world market. Currently around 30 per cent of the company's total production is exported to various markets worldwide (EU, Russia, China, Hong Kong, Africa, South America and the Middle East). In order to expand its production capacity, Granja Tres Arroyos has decided to build a new hatchery in the province of Entre Rios, fully equipped with Petersime incubators and a Petersime ventilation system. To minimise the environmental impact as well as to reduce the production cost, the management of Granja Tres Arroyos decided to invest in the latest heat recovery technologies for efficient climate control. Dr Joaquin De Grazia, president of Granja Tres Arroyos: "As a company, we want to keep on growing on the international markets. To achieve this, it is our strategy to always look for the latest generation technologies that are authorized by the most demanding markets. The total hatchery solution Petersime offers us for our new hatchery project definitely qualifies for that." Mr Hemeryck, Area Sales Manager of Petersime, commented: "It is an honour for us to work with a company like Granja Tres Arroyos for the first introduction of our BioStreamerTM technology in the Argentinean poultry market. The search for improved biosecurity and better hatch results directs people towards single-stage incubation. With our Embryo-Response IncubationTM technology, we have the appropriate answer for that."